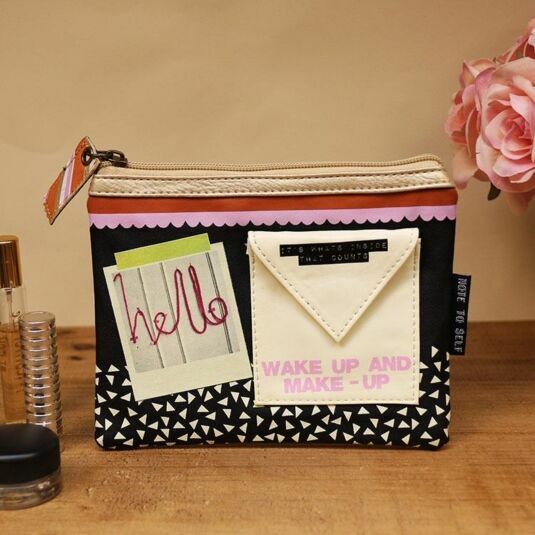 This Hello Make-up Bag is the perfect size for your essential cosmetics, or as an overnight toiletries bag. The faux leather front is black with a pattern of cream dancing triangles. Near the top is a scallop-edged pink printed band, followed by an orange printed band. Above these there is a faux leather-edged zipper in gold with a faux leather tag. 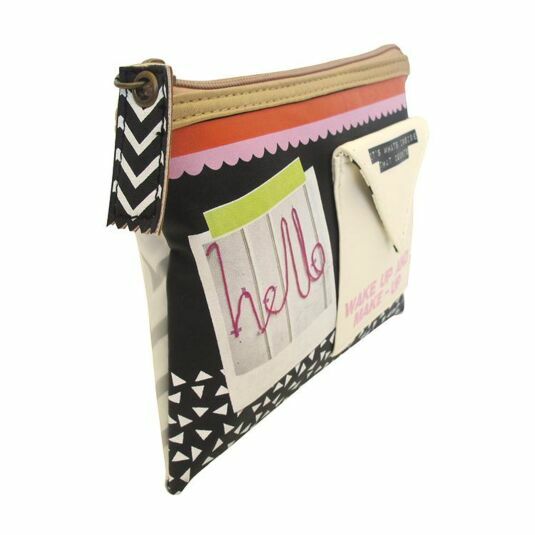 The front of the bag features a printed-on polaroid photo of the word Hello in pink yarn, next to which is a cream pocket with the words WAKE UP AND MAKE-UP printed in pink capital letters. The flap of the pocket has the important message IT’S WHAT INSIDE THAT COUNTS printed in label-maker lettering. 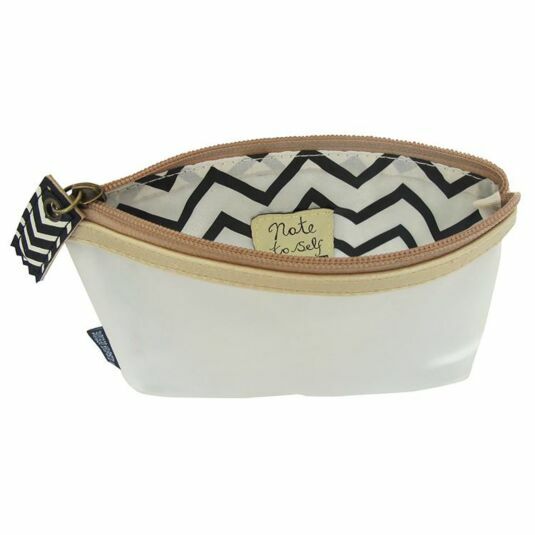 A press-stud fastens the chevron lined pocket. 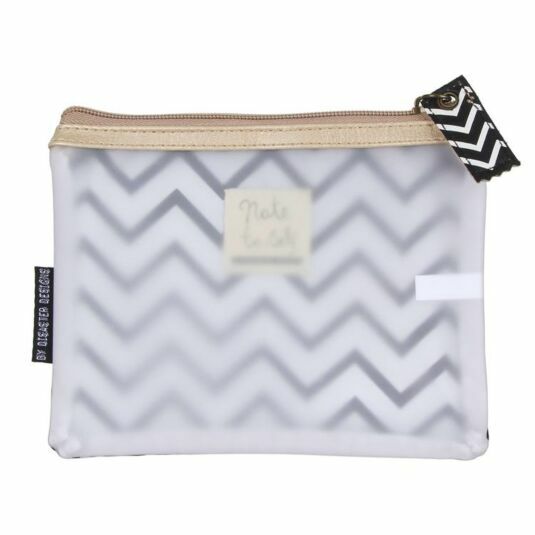 The interior of the bag is lined on one side with matching chevron-printed water-resistant fabric. The other side is semi-transparent plastic. 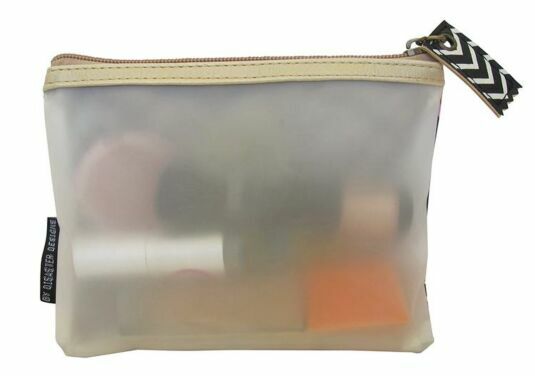 Not too big and not too small, this is the go-to bag for your overnight make-up or toiletry needs. There is also a matching larger version if you need to pack more kit. 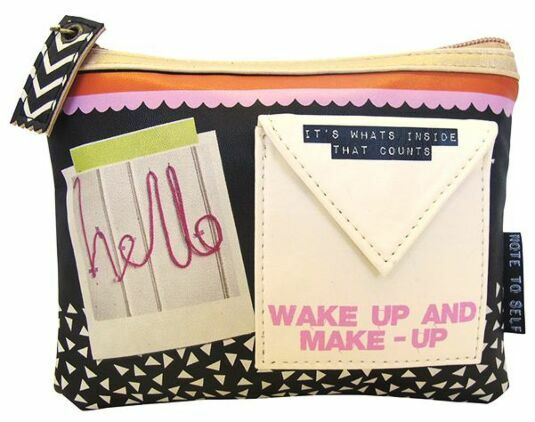 Modern in style, this useful make up bag will appeal to teens, mums and grandmas, anyone who likes to keep their favourite make up in a stylish bag.